Sirmaur : What kind of girl gets bitten by snakes 34 times and lives to tell the tale? Meet 18-year-old Manisha from Himachal Pradesh. In the last three years, many snakes have made futile attempts at her life, however, the eighteen year-old says whenever she sees a snake she gets enchanted. “I was bitten by snakes for the past 3 years over 30 times now. I got snakebite first time at my village near a local river. This time I was bitten by a white snake, whenever I see a snake I get enchanted and it bites me. There was a gap two years back when I did not get any snakebite. During my school hours I was bitten by snake many times and sometimes I was bitten twice or thrice a day. Astrologers and priests here they say that I have some connection with a deity,” she said. However, the doctors have claimed that most of the bites have been by non-poisonous snakes or snakes with less venom. According to records available with different medical centres and hospitals, she got bitten for the 34th time on February 18 this year. The medical Superintendent of Dr. Y.S. Parmar Medical College and Hospital said that she was admitted with snakebite on February 18 in the hospital and now she is recovering and stable. “She was admitted here with a symptom of snakebite. It seems to be a non poisonous snakebite as over 80 per cent snakes here are non poisonous,” said Dr. KK Prashar medical Superintendent. The girl’s father now says that snakebite cases have become a routine for her. “I have taken her to many temples here besides priests and traditional doctors, as there is a belief in our region that with the blessings of local deities’ temples it could be avoided,” said Sumer Verma, the father of the girl. 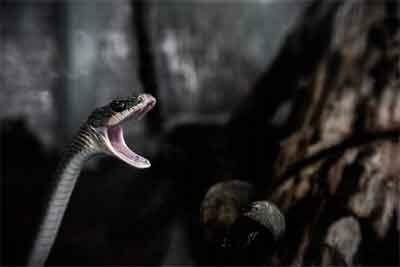 People who study snakes in the region say that the snakes biting her may be non-poisonous. “I really don’t know which snake has bitten her. We have Viper and Russell snakes available in Shillai and other areas of Sirmaur which neurotoxin. But also the rattle snakes are common here. It may be some non poisonous snake that may have bitten her,” said Forest officer working in the region, Virender. The veterinarians however are of the opinion that getting continuous snakebites may have developed antibacterial properties in her body. “I really don’t know which snake has bitten her but we generally give venom to horses to develop antibody to prevent snakebites. Same may be the reason she is surviving from continuous snakebites,” said veterinarian Dr. Rohit working with the forest department of Himachal Pradesh government.